Dr. Diane uses wit and wisdom to explain how biology influences behavior. She is a psychologist specializing in Cognitive Therapy who is uniquely able to present the mechanisms and effects of brain function, neuropsychology, social factors and hormones on daily behavior. She gives specific techniques to manage stress, improve relationships, health, and achieve a higher level of satisfaction in life. Her cognitive approach is designed help people think more objectively about situations, relationships and, develop successful strategies for greater satisfaction. 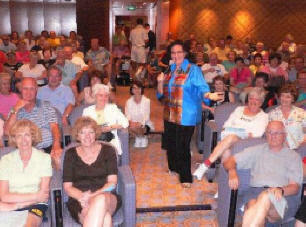 Dr. Diane has received rave reviews and awards for presentations in academic, business and cruise settings. Her pledge is to provide interesting and useful information in an entertaining way. § How to Talk to a “Y” Chromosome: Effective Gender Communication..
Have fun learning a new way to “win” without stressful arguments. Audience participation and humor make this an winning presentation. § Stress Management: Managing Stress Before it Manages You. Understand how stress works to sabotage you, and the simple secret to subdue it. Dr. Diane combines behavioral medicine, wit and wisdom, to teach you how to quickly control your stress. Learn to turn stressful situations into satisfying, self-esteem building experiences. Bring your “Mountains” and watch them turn into “Molehills” before your eyes. Learn the basic method to turn any work or family relationship into a more positive one. Learn to defeat failure, and stack the odds of success in your favor. Come and have fun, and discover how to gain satisfaction, and get what you want in life.